A unique and uniformed dress code creates a feeling of belonging to that institution and also creates a sense of discipline among the employees. It also creates brand recognition of that institution. At present, all the institutions require a uniform dress code for their employees. 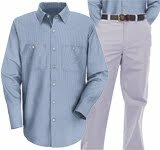 Most of the institutions have a specific color scheme or some specific prints, which they want to add to the dress code of their employees. And so exalonpromotion has an exclusive section to cater to the needs of the different organizations. We have our own manufacturing units.